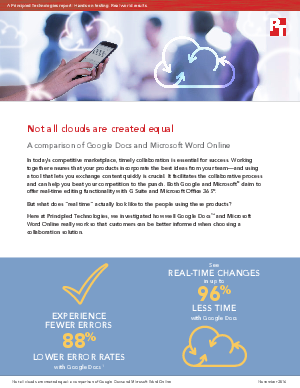 What happens when teams switch to Google Docs from Microsoft Word Online? They can share documents in nearly half the time, see real-time edits 96% faster and cut down on errors by 88%. Get more findings and how-tos in this detailed report by Principled Technologies, which compares the performance of collaboration and productivity tools included in G Suite and Microsoft Office 365.